There are never more opportunities to bet on a game in the United States, or anywhere in the world for that matter, than with baseball. Simply put the 162-game schedule that each team in the league plays, plus the playoffs, dictates that. But at the core of baseball betting lines are the odds to win the World Series. 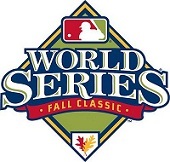 The Fall Classic is a heart pounding seven-game series where the two champions of the American and National Leagues get together to compete for one of the most recognizable trophies in all of sports. Betting on the World Series is very popular, and there are a variety of ways in which you can do so. At EntertainmentBettingOdds.com, we've got plenty of experience and our readers are welcome to learn about things such as when World Series odds can be bet, where to bet the World Series online plus help with wager types + methods. The Detroit Tigers are on top of the latest betting lines to win the 2014 World Series on into the second month of the season. The Tigers are set at 6/1, ahead of the Los Angeles Dodgers out of the National League (15/2). The team that has made a jump is Oakland. The Athletics are third on the overall odds, sitting at 10/1 alongside St. Louis, and Washington. World Series betting odds are some of the most popular betting lines you will find, and online sportsbooks dedicate plenty of time to making sure that they are available for bettors. Below, we have reviewed for you one of our best online sportsbooks for World Series betting odds, so check them out and see what they have to offer. Check out the latest World Series betting odds available at Bovada, and get in on the action, before, during, or even right after the completion of a season. 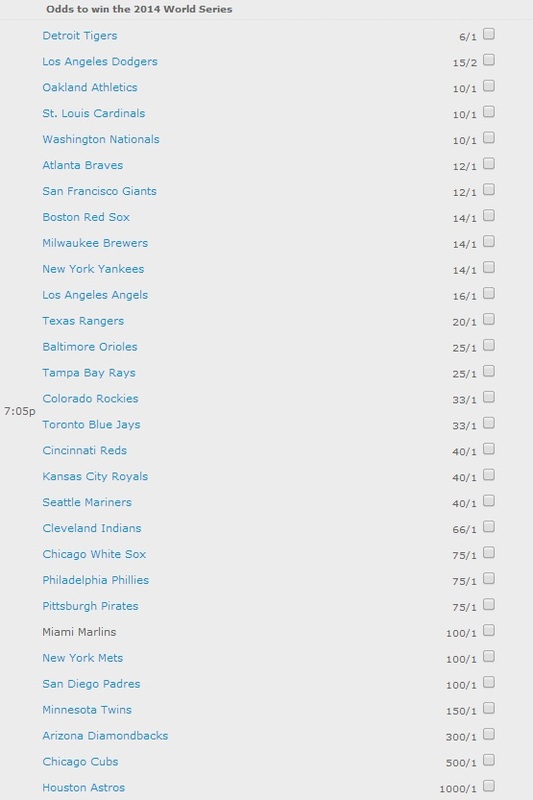 Bovada formulates World Series futures wagers immediately following the World Series from the season prior. They remain up all season long where bettors can lay down a wager and bet on who they think will win. And when it comes time to play the actual series, Bovada will be all over the coverage, formulating game lines, and prop odds for every game of the series, whether it's a four-game sweep, or a seven-game thriller. There are several ways in which bettors can cash in on betting on the World Series. Find out about World Series Futures odds, as well as the game lines, prop bets, and even the ability to bet live during the Fall Classic in real time, below. We have all of the information for World Series betting you need. World Series Futures Odds - Up roughly the day following the World Series' conclusion from the year before, online sportsbooks take to the betting odds and install a new favorite for the following season. These World Series futures in the offseason do not see much variance, but when the trade deadline approaches and teams make some big deals, it certainly has an effect. During the long months of the MLB season, World Series futures odds will also change depending on how teams perform. World Series odds are also fun because bettors can make some of the biggest profits you will see when it comes to a baseball wager. World Series Game Lines - Each game played in the World Series will have its own run-line, moneyline, and over/under run total installed for it. The run line typically sits at a constant 1.5 runs, but that doesn't mean that the favorite to win the game straight up on the moneyline will be favored to cover the spread installed by the run line. Game lines for the World Series are formed after the conclusion of the previous game. World Series Prop Odds - A variety of prop betting odds for the World Series come out. They can relate to the series on the whole, such as total number of games played, exact result, and things of that nature. But they also can be for each individual game, such a team props and play props for performances just for the day. Prop odds for series sports like baseball have that extra element of series props that bring in new excitement to betting. World Series Live Betting - Get inside the game and bet live on the World Series with the service offered at many online sportsbooks. Bovada for example has a live betting section that will bring you into which game you want to wager on that is currently taking place, and will show you the available bets. Place a wager, wait for a wager, it's up to you during this process. Betting live on the World Series sure can be fun though.